R1505 Half Glass Showcase (White Finish). 1200mm x 600mm x 900mm (L x D x H). Contructed from durable 15mm MDF. 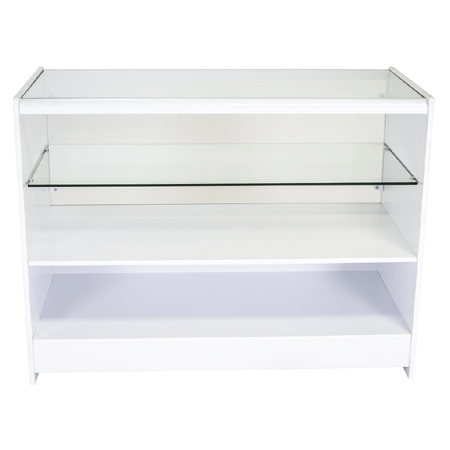 8mm thick glass top with one glass display shelf and concealed storage area beneath. 5mm safety glass panel at front. Please note this product is heavy and requires basic flat-pack assembly skills. White finish with colour co-ordinated aluminum trim. Despatched in 2 boxes.